"The best time to plant a tree was twenty years ago. The next best time is now." If you are a business and are interested in providing funds to help school or community groups plant trees please get on contact to find out how we can help. We have a support package based on our successful Trees for Schools Programme. If you are a school and would like help planting some trees/shrubs to promote wildlife and provide a woodland for the future please let us know. Thirteen Staffordshire schools took part in Trees for Schools, a tree planting programme, in the spring of 2016. The programme was sponsored by ENGIE, the majority owner and operator of Rugeley Power Station and delivered by Tanglewood. The ambition of Trees for Schools was to make a long lasting and beneficial contribution to the education and development of young people by planting trees in school grounds - in the future these developing woodlands will become a focus for Outdoor Learning. Learning in the school grounds is highly motivating and enables young people to develop new skills and build relationships. It makes young people more engaged with learning and therefore more likely to do well. 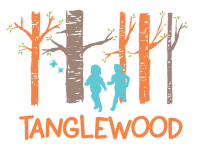 To help schools with the tree planting Tanglewood called on the support of members of the Staffordshire Forest Schools Cluster Group, notably education staff from the Forestry Commission and Creative Outdoor Learning. As part of the programme Tanglewood also provided help and advice to the teachers about how they can use their growing woodland in the school curriculum.